"Pineapple wedges marinated in honey, brandy and lemon juice and grilled. A hot, sweet island-flavor treat! This recipe is from The WEBB Cooks, articles and recipes by Robyn Webb, courtesy of the American Diabetes Association." To Marinate: Combine honey, brandy and lemon juice in a nonporous glass dish or bowl. Mix together and add pineapple; coat well with marinade mixture. Cover dish and marinate in refrigerator for 1 hour. Preheat grill to medium heat and lightly oil grate. Remove pineapple from dish or bowl, discarding any leftover marinade. 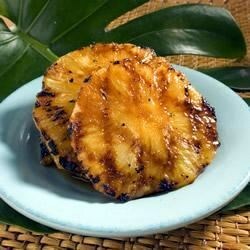 Place pineapple wedges directly on rack or in a basket and grill for about 10 minutes, turning, until pineapple is hot and caramelized. Learn how to make this delicious, sweet summer-time dessert topped with cream. 7-10-11: This was OK, but Ann didn't eat much because the pineapple was reacting badly. Did it in the broiler, not the grill, and used vanilla extract for the brandy. instead of using the cherry brandy, i use the marchino cherry juice. it gives it a cherry flavor and gives it a little color. great tasteing!!! I also used vanilla for the cherry brandy. It was an amazing dessert! i made more marinade so it would really soak in the flavor. And we served it with a little scoop of vanilla ice cream on top.